Arsenal have reportedly been handed an injury boost with the news that defensive stalwart Laurent Koscielny is expected to return to training earlier than expected. 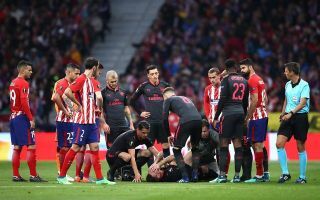 The 32-year-old has been out of action since last season’s Europa League semi-final clash against Atletico Madrid, during which he suffered an Achilles tendon injury. That in turn forced him to miss the World Cup earlier this summer, and his rehabilitation work has continued while Unai Emery has begun life in charge at the Emirates. Following the summer signing of Sokratis Papastathopoulos, competition for places has increased in the centre-half positions, and so Koscielny will undoubtedly be itching to get involved again to win his place back. Naturally, the focus for now will be on ensuring that he makes a full recovery and doesn’t suffer any setbacks, and according to the Evening Standard’s James Benge, as per his tweet below, the French international will return to training earlier than expected by November. Laurent Koscielny’s return to training has been pushed slightly forward, now aiming to be back on the pitches in November. That’s great news for Emery as he will surely benefit from having the Arsenal stalwart’s experience and defensive qualities at his disposal sooner rather than later, particularly considering that they’ve conceded six goals in their opening three Premier League games of the season. In turn, they’ll need to tighten things up at the back and Koscielny may well have an important role in doing that to ensure that the Spanish tactician enjoys a successful first season at the club. Sokratis and Shkodran Mustafi will likely continue until his return, and so they’ll be aware of the pressure that they will be under when Emery has a solid option to possibly replace one of them if they don’t perform to a high level.